CNES and Airbus-Safran Launchers are working on a next generation of the main stage rocket engines, promising reduction of costs by 1/10th and a reusability for over 5 times. During the ESA’s Ministerial Conference in December 2014 design of Ariane 6 was selected. 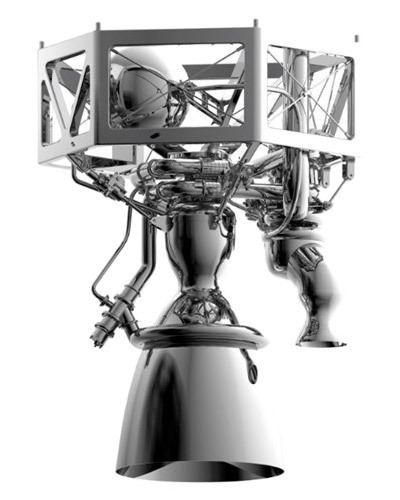 Based on a cryogenic main stage with 2 or 4 solid rocket boosters proposal also included a simplified, cheaper version of the cryogenic engine used in the main stage of Ariane 5 – Vulcain 2. New variant, dubbed Vulcain 2.1, while maintaining 1340 kN thrust of its predecessor, will include numerous new technologies in order to reduce production costs, notably a new nozzle extension that will utilize laser-welded sandwich walls and a 3D printed structural reinforcements. Future updates for Vulcain include version 2.2, development of which is currently in an early stages, and almost fully 3D-printed Vulcain 2.3 that’s planned once work on Vulcain 2.2 is completed. All these variants will most likely be used in future upgrades to the Ariane 6. However, it’s no time to rest on laurels. In 2015 French space agency (CNES) and a newly established joint venture Airbus Safran Launchers (ASL), thinking ahead, initiated development of the Prometheus (Prométhée). A brand new rocket engine with over a 1000 kN of thrust, that will bring 3 big things to the table: radical decrease of manufacturing costs, reusability and a new fuel. Design of Prometheus is planned to make an extensive use of additive manufacturing (3D printing). Current aim is to reduce the price 10-fold, from €10 million for Vulcain 2 down to €1 million for Prometheus. Simplified engine design and a use of new techniques will also allow ASL to decrease the manufacturing time by 50%. Safran Engines plant in Vernon (France) already begun production of prototype 3D printed components for the engine. Such a dramatic decrease of the price would enable ASL to profit from investments in the new engine regardless if reusability is proven to significantly reduce costs or not. Prometheus will be the first reusable European rocket engine of its class, designed for a minimum of 5 reuses, however more than 10 reuses are being mentioned by CNES. Several companies around the globe are already developing reusable launch vehicles. Airbus proposed ADELINE, which could utilize Prometheus. It could also be used in a possible future rocket capable of vertical landing: a 15-meter tall testbed for it is being developed within joint French-German-Japanese (CNES-DLR-JAXA) project called Callisto. Currently, however, there are no plans to use Prometheus in any actively developed rocket. It’s easier to store – while hydrogen needs to be kept in temperatures below -252 °C (20 K), for methane it’s -161 °C (112 K), which is enough to keep it liquid inside of the rocket without any special thermal protection. It also makes a industrial processing and storage of the fuel cheaper. Its boiling point is closer to the one of liquid oxygen (-183 °C (90 K)), which allows for simpler rocket design, with less thermal protection between fuel and oxidizer. LOX+LH2 has a lower bulk density than LOX+LCH4 (290 kg/m3 vs 820 kg/m3), what means smaller and lighter fuel tanks, feed lines, even turbopumps. Hydrogen embrittlement isn’t a problem, which makes the engine and various other components of a rocket (notably fuel tanks) much more suitable for reusability. It doesn’t heat up upon expansion and doesn’t explode in contact with oxygen, so it’s less prone to explosions, again: simplifying the design. It’s not building up the pressure in as high rate as LH does (expansion ratio of 233 vs 851) and doesn’t require topping the rocket with fuel till the very last moment before the launch – which means cheaper ground operations and lower risks. Development of the Prometheus has begun in 2015, with contract between CNES and ASL signed on November. During the ESA’s Ministerial Conference in 2016 both parties presented a proposal for ESA to join the development. ESA decided to fund the project with additional €82 million from Future Launcher Preparatory Programme (FLPP). Looking into the future, the first tests of Prometheus are planned for 2020, which is also the year Ariane 6 will fly. Next generation of launchers is planned for around 2030, which should give it an abundance of time for any possible delays. Looking so far ahead is not an unusual situation in the industry. Designing and qualifying rocket engines is a very time-consuming process. Design of Blue Origin’s BE-4 begun in 2011 and it took 5 years till for testing to begin. So it did in a case of SpaceX Raptor, starting 1/3 scale prototype testing last year. During the Journée de l’innovation 2017 in Toulouse an additional information about the developments in CNES were released. Under codename Ariane Next the team of 15 engineers lead by Jérôme Vila is pursuing a successor to the Ariane 6. An objective of the new design is to reduce launch cost by half comparing to Ariane 6. It will be designed to carry both: commercial and institutional payloads and its design will be flexible enough to allow for rapid increase in a number of rockets manufactured when market demand from mega-constellations increases, or remain profitable if the number of launches remains relatively low. Due to new players coming into the market, such as Blue Origin, development cycle of the next Ariane is planned to be accelerated, from 10 years down to 5. Future for European heavy launch vehicles certainly looks interesting, and Prometheus will become an integral part of it.